SAN FRANCISCO — A steady stream of Darth Vaders, Princess Leias, Boba Fetts and, of course, Stormtroopers descended on AT&T Park here Sunday as the world-champion San Francisco Giants played host to the Empire for Star Wars Day. In a city known for its geek fascinations, seeing Jedi mix with hard-core baseball fans is not an uncommon occurrence, but the Giants' game against the Arizona Diamondbacks was the first-ever Star Wars Day for the franchise. And the team went all-out. Fans got a pre-game costume contest, a post-game screening of Star Wars Episode V: The Empire Strikes Back in the stadium, Stormtroopers guarding the field during the "Star-Spangled Banner," giveaway statues of Giants closing pitcher Brian Wilson — frozen in carbonite, Han Solo-style — and the opportunity to generally geek out throughout the game. "We don't even know what the score is," said 33-year-old Ryan Flores, above right, who came in a Giants bounty hunter uniform. Flores told Wired.com that he and his Boba-Fett-meets-Giants-costumed friend, Robin Lopez, 31 (above left), were distracted from the game's play-by-play due to fans wanting pictures with the pair. "I'm a geek and if I can make a little kid smile, that makes my day," Flores said. During the game, Giants players were shown in Jedi garb in their photos on the stadium's giant screen. Between innings, the park showed Star Wars clips, including one featuring the team's mascot, Lou Seal, inserted into key scenes from the film franchise — changes that went over better with fans than last week's addition of Darth Vader screaming "No!" in the upcoming Blu-ray version of Return of the Jedi. In the end, though, the Force was stronger with Star Wars fans than with the Giants, who lost to the Diamondbacks 4-1 after an 8th-inning rally by the Arizona team. 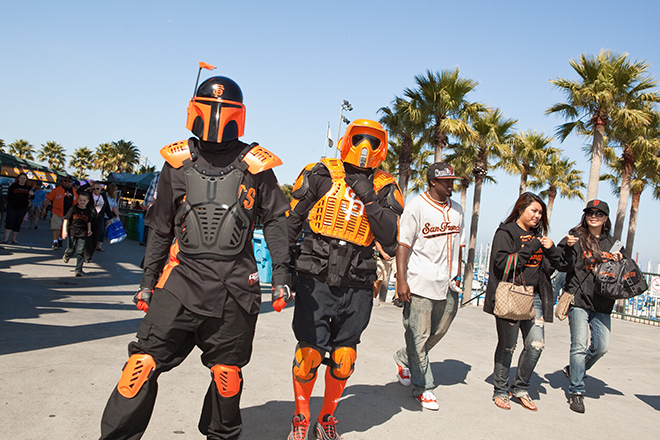 Click through the gallery above to get a taste of San Francisco baseball's geekiest day, and, as one fan's sign said, "May the SForce be with you."